Having very little blogworthy news to share this week, I decided to give my blog site a long overdue facelift. Using blogger's new template designer, it was easy to add a little more pizzaz to the site. Esther has been enjoying the new MacBook Air while I have been dealing with some issues with my 'faithful' MacBook. One highlight of the past week was having missionaries Dan and Carrie Ritzman at our small group. They are missionaries in Belgium serving Iranian refugees. It was interesting to learn more about the Ritzman's ministry and this unique ethnic group with it's rich history and culture, as well as the people's great hunger for the gospel. 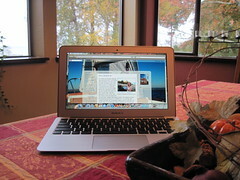 I like the blog facelift!